The race will start at 08h00 and 08h15 at FNB Bank City. The FNB Joburg 10k CITYRUN is run and organized in accordance with the rules of the International Association of Athletics Federations (IAAF), Athletics South Africa (ASA) and Central Gauteng Athletics (CGA). 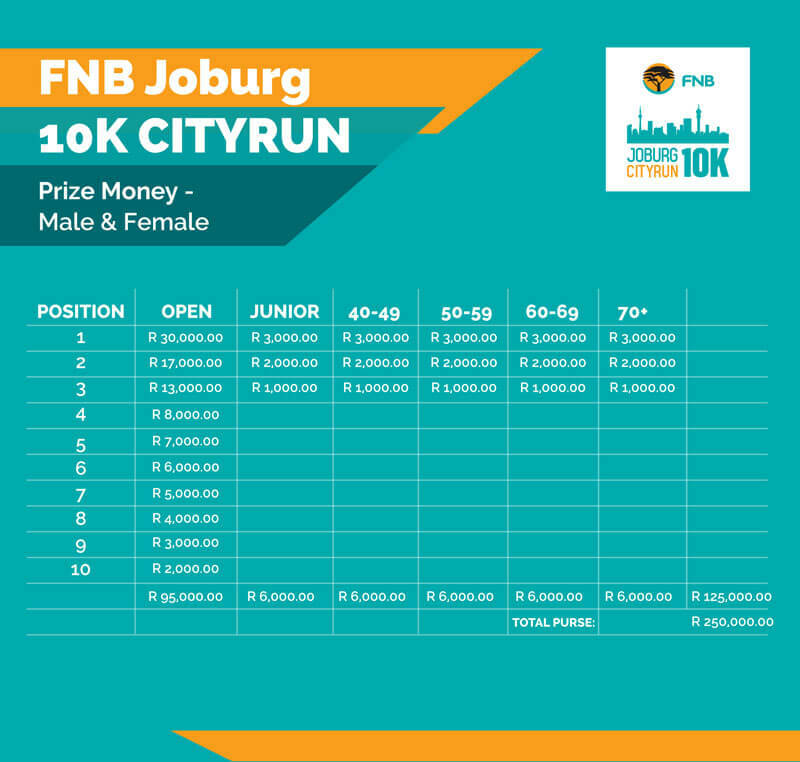 The FNB Joburg 10k CITYRUN is open to all licensed and non-licensed runners. Temporary licenses are available at R35. Wheelchair entrants are encouraged to take part. Once entered, they are requested to contact entries@joburg10k.com to secure race day access. Baby Joggers and Prams are allowed on route but may not take part as contenders and accept that they are responsible for ensuring they are not involved in any collision or disruption to other runners. A Podium Presentation of the top 3 male and female finishers will take place immediately after the results have been signed off at the finish area. Prize giving for Age Categories will be held at 10h00 at the Prize Giving stage. The results of the Contenders will be posted at 10:15 am in the TIC (Technical Information Centre). The cut-off time to finish the race is 11h30. All Contenders must attend the Technical meeting on Monday, 23 September 2019 before the race – time and place to be confirmed. For any questions, please contact entries@joburg10k.com. Applications for the Contender seeding will close 4 weeks prior to the event (27 August). All Contenders must attend the Technical meeting on 23 September. The tog bag trucks will be close to the start and finish so you have an option of where you would like to drop and collect your bag. Your tog bag tag is on the bottom of your race number, simple tear it off and attach it to your tog bag. Your race number will serve as the corresponding number when you retrieve your tog bag from the location you dropped it off at. Batches A,B,C and D will start at 08h00, while batches E & F will start at 08h15.